Another daddy daycare day picture series. This time, the theme was “seeds and beans.” We read A Seed is Sleepy and The Carrot Seed before planting a bean seed or two in eggshells. Then the girls made bean mosaics. Chaos quickly ensued. But Tig was able to pull off a bean face before taking them out for a walk. Here are some pictures from daddy daycare day a few weeks ago. We bought some beeswax sheets and made candles. The kiddos enjoyed pretending it was their birthdays and blowing out the candles. And a very grateful shout out to Pioneer Woman for explaining why my photos look bad on the web. Thanks to her post, my pictures look not as bad as before! I hesitate to put this up because it is not representative of what we eat for lunch. But I enjoyed these crabcakes so thoroughly, I thought it was worth remembering. Violet, being a toddler, would eschew all meals in favor of snacks if she could, so lunches and dinners are often hit or miss. In my pre-parenting days, I would have haughtily declared that our kids were going to eat what we are eating. There would be no kids meals. Oh how quickly a two-percentile-weight toddler will change things. Still, I’m resolute in the mission to serve real food. Thinly sliced baguette pieces, brushed with olive oil and toasted with a sliver of Monterey Jack (using a vegetable peeler)–I called them “crackers.” V liked how they crunched. A tiny silicone cup of blackberries. It’s a constant evolutionary arms race, trying to get food into our little peanut. Just when I develop a strategy, she changes things up. I’ll let you know how it goes. Slices of apples spread with peanut butter (almond butter will also work) and dotted with raisins, cranberries or dried cherries. This is a much enjoyed riff on “ants on a log.” We played off V’s fascination with sea turtles and the book Turtle Splash.
. . . now there are nine. This week I feel like writing about food. We have had some yummy breakfasts the past few weeks and I wanted to share. V is enjoying cooking more and more these days. She insists on scrambling our eggs in the morning. And she does such a great job. Tig adds just enough milk and cooks it ever so gently. The result is deliciously creamy eggs, soft and fluffy. It’s important for us to start her day off with a little protein. Most of the time its eggs. Sometimes it’s yogurt or oatmeal with ground nuts. Apple crespelles made by Tig one weekend morning. Filled with apples, honey and dusted with a sprinkle of powdered sugar. The kids version without sugar. On weekends we might add a bit of apple smoked sausage to the menu or a glass of green smoothie. We save the carb-heavy breakfasts such as pancakes for special occasions. But always, the focus is on whole foods. As I was writing the simple guide to festival planning, I thought ahead to Valentine’s Day and what I wanted to get out of it. Most years I think of Valentine’s Day as being inconsequential or forgettable. The commercialism surrounding the day doesn’t interest me, and the history behind St. Valentine and his annual commemoration is a bit too heavy for our young family. Creating and working with my hands is like a deep drink of water for my soul, and although it will be fun to delve into tissue paper stained glass hearts, love notes, chocolates and flowers, I also realize they are just things. In Roald Dahl’s book, The Big Friendly Giant, Sophie discovers the BFG’s collection of dreams: rows and rows of jars, each jar holding a swirl of smoky colors, a single dream. I think each special day has it’s own essence, a core energy that tumbles throughout the household. These beautiful, ephemeral feelings we can’t capture and store in a jar, but we can conjure it through head, hands and heart. For Valentine’s Day and this week, it seems natural to meditate on the energy of love and warmth. How to cultivate that loving energy? I’ll refer you to a far better writer on that subject: Kyrie Mead’s Warmth Week Posts over at Are So Happy is a series exploring how to create physical and emotional warmth in the home (which is closely tied to the expression of love). Lots of hugs, and time in our arms and laps. Tig and I joke that her middle name is Bao Bao which means “to hold” in Mandarin (not to be confused with baobab’s in The Little Prince). She live and thrives on physical affection. Being a patient and engaged meal companion even after hours of leisurely lunches and snacks. The words, “I love you” don’t mean as much, but I say it anyways. And we could go on doing this for our spouses and each family member. And here is my confession: I don’t do enough of the above. Some days I come home late, sneak glances at my blackberry during meals and weekends, work on my laptop, clean the house when my daughter wants me to read a book, and eye the clock as bedtime approaches. Not all the time, just enough to make my heart sink when I reflect on a busy day. This week, I’m on a mission to distill my love for my family, and to savor. every. drop. I know what I need to do [slowly closing my laptop]. P.S. I still want to make those stained glass hearts. As promised, here is the tutorial for making the paper dragon from the last post. I made this one morning with V and loved the way it turned out. The idea originally came from Martha Stewart, but I also looked at the ones sold in Chinatown and made my own version and template (below). 1. Referencing a few Chinese New Year children’s books, I roughly sketched out a dragon’s head, two body pieces, and the tail directly on the red paper (you can see my sketch lines in the picture above). If you don’t feel like drawing your own, I’ve included a template here. 2. Next I cut the pieces out with a pair of scissors. For the whiskers by the nose, you will need an exacto knife. Hole punch the ends of the pieces–they are marked on the template–and the eye. 3. Decorate the dragon however you would like. We used mosaic stickers from a kit that a friend gave to us. 4. Fasten the body together with the brass fasteners. I asked V to help me with that part. 5. Tape chopsticks or any appropriate sized sticks to the tail and head end of the dragon. After I had put the dragon together, V insisted on putting a brass fastener in the eye of the dragon. I liked the extra touch. Dragon Dance from Serena on Vimeo. Then we marched around the house, V holding the dragon while I played the “drum” (a paper plate). Here’s a short 10 second clip of her doing dragon march (our videos are shot with a handheld phone, so the quality isn’t that great, but you get the idea). Violet playing with a paper dragon we made. A tutorial and template on how to make your own will be available this Saturday. The act of celebrating festivals helps us to wind down time and savor the stops along the way. Our ancient ancestors celebrated the rhythms of the earth: the changing of the seasons, the phases of the moon, the turning of the tides, migration patterns of herds, and harvest cycles. It was a time to appeal to the gods and helping spirits, and a time to enjoy life together in the tribe or community. Festivals help to create reverent pauses, or to borrow the phrase, “cathedrals of time.” They help to color the year by infusing special days with feelings and reverence. But don’t do it out of obligation, it will only be yet another burden on our already full plates. Do it because you truly enjoy it and believe in the benefits of a rhythmic life. If you’re still with me, lets take a look at how busy parents can create simple yet meaningful celebrations. The first step is to figure out which festivals are important to your family, and how many you can handle in a year. If you observe a religion, the religious holidays emphasized by your faith would be an obvious place to start. Secular families may focus instead on seasonal celebrations such as the solstices or the equinoxes. On a calendar, lay out the celebrations that are important to your faith, or have personal meaning to you and your significant others. Write down national holidays, birthdays, and anniversaries. Once they are all laid out, you might find the calendar getting quite crowded. Start prioritizing your list. If you could only plan four festivals a year (one every quarter), which ones would you pour your energies into? These are your A-list festivals, your “must celebrate” days where you can try to pull out all the stops. Others can be on the B-list; you still celebrate them, but you don’t have to go all out. Maybe you’d even have a C-list, where you may opt to skip them entirely or do only one thing in honor of the day. As I’m fairly new to festival planning, starting small is key. For us, Chinese New Year and the Moon Festival are two important ones from our culture that we try to observe. Halloween is a favorite of Tig’s–although we haven’t fully celebrated its potential. We also enjoy apple harvest time, Thanksgiving, and Christmas to a smaller degree (I’ve been playing with the idea of observing St. Nick’s Day, it’s more austere and European counterpart). After that, a couple other holidays such as Valentine’s Day and Easter are optional. After laying out your calendar, you’ll need to start planning for the first upcoming festival. You can start with a brain dump and write down everything you’d like to do. Sit down with your partner and reminisce about any of the fond memories you have from your childhood. What do you remember most? Look at your magazine stash, your bookmarked websites (Rhythm of the Home has some good inspiration), and your favorite books. Don’t hold back. Once you have all the ideas, it’s time to pare it down. Because this is the Simple Guide, I like to keep my plan on one sheet of paper, which I fold into six parts. Each section is labeled: people, decorations, food, activities (field trips/arts and crafts), music/songs/verses, and books. A pdf version of the sheet is available here. Pick one or two areas that you feel are important to focus on for this particular festival. Are you a food family, or do you really like to deck your home out with decorations? List only a few things in each category. For Chinese New Year, it’s all about food in our family. Everything else plays second fiddle. What will give you the most bang for the buck? What would infuse your family’s memories with the most feeling? For example, smells are often strongly linked with memories. To this day, the heady perfume of paperwhites, or Narcissus flowers, bring back childhood memories of Chinese New Year in Hong Kong. Think foods, flowers, scented candles, and drinks. Which items can be outsourced? Can you have some food ordered as take-out? Can you do a potluck instead? Semi-homemade food instead of all from scratch? Can friends bring the drinks or provide music? Instead of inviting your entire party list for all your celebrations, can you invite a smaller subset for each celebration? If time is tight, can you kill two birds with one stone? For example, baking an apple pie can be both the food and activity for an apple harvest festival. Hopefully, after you pare down your list, you will have a manageable roadmap on one sheet of paper. Talk to your partner and children and divvy up the tasks as appropriate. Get help where you can. We would not have been able to throw a New Years party without Tig’s parents. We are so grateful for the help. The week before, talk with your children about the upcoming days. Read some books together to get into the mood. Build up to it. Are there other activities that you can scale back during festivals, perhaps less playdates and classes? The whole point is to have fun memories and to cultivate a sense of wonder and enjoyment, not to heap on more stress. If you have in your mind the things that matter most, you can let go of the rest. Some of my childhood memories consists of the murmur of adult voices and laughter as I drift off to sleep. After the celebration, take some time to debrief with your family. Sit down with your partner and talk about what went well. Which things had the most impact? What would you skip next year? What different activities or foods would you like to try next year? Would you celebrate this particular festival again? Over time, our family will build up a roster of favorite holidays and festivals. What once felt contrived or awkward will become more natural as the years go by and we get into a groove. We can still fine tune and tweak, but there is comfort to the rhythm. For myself, I’ll be keeping a binder of my simple planning sheets as “recipes” for the next year. This weekend we celebrated the year of the rabbit with a party. The intoxicating scent of paperwhites (narcissus) brings me back to Chinese New Years in Hong Kong. Oranges, chocolate coins wrapped in gold foil, and red candy. It’s important to get the oranges with leaves. Hung bao, or red envelopes are usually filled with money and given to children. This year, instead of red, I decided on these peach colored envelopes. Not having time to do papercuts, I printed a few pictures off the internet and included them with a couple of dollar bills. Grandpa Jack shows off his killer knife skills. A dish of many different vegetables, eggs, and mung bean noodles. Tig makes his famous sesame balls (recipe from Wisdom of a Chinese Kitchen). The rest is takeout from Chinatown. I made some bubble tea. Pork buns, rice wrapped in lotus leaves (zhong zi) and roasted duck. But none of it would be possible without Grandpa Jack and Grandma Jennifer. Thank you. We love you. Bubble tea can be made in a myriad of ways. Here is what we did for our party. Many of the ingredients can be found in Asian grocery stores, or you can order bubble tea supplies on-line. Brew one pot of jasmine green tea, set aside to cool. Boil water in a large pot. Add in the tapioca pearls to boiling water. The tapioca pearls should float in the water. Boil for 10 minutes, then turn the heat off and let the pearls sit for another 10 minutes. Sample to check the consistency of the pearls and cook them longer if they are too hard in the middle. When the pearls are done rinse them in cool water and drain. Store them in a mason jar with some cool water. Open the two cans of lychees and reserve the liquid in a separate mason jar or pitcher. If you don’t have access to canned lychees, you can make a simple syrup. To make your bubble tea, pour jasmine tea into a cup. Add a few spoonfuls of tapioca pearls. Add lychee juice to taste and some ice cubes. If you want to add milk or creamer, it is optional. I prefer to keep it simple so the flavors of the green tea and lychee shine. Drink through a large straw. 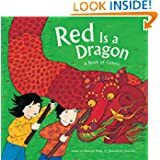 Red is a Dragon: A Book of Colors | Roseanne Thong, Illustrated by Grace Lin. A little girl explores her world in colors, from red firecrackers to jade bracelets. 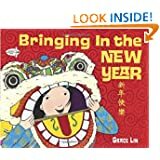 Bringing in the New Year | Grace Lin. A Chinese American family prepares for the Lunar New Year. 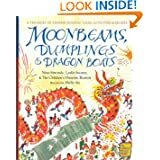 Moonbeams, Dumplings & Dragon Boats: A Treasury of Chinese Holiday Tales, Activities & Recipes | Nina Simonds, Leslie Swartz, The Children’s Museum Boston, and Meilo So. If you do not have access to an asian food store, the recipes in this book (which I have not tried) and the next are adaptations using more commonly found ingredients. Wisdom of a Chinese Kitchen: Classic Family recipes for Celebration and Healing | Grace Young. 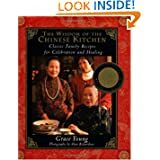 This lovely book is a series of biographical essays with information about Chinese food and healing from a Cantonese perspective. "One sees clearly only with the heart. What is essential is invisible to the eye"
Mama to Violet and Otter (not their real names).